In March we received a generous donation of £675 from Barnard Lodge of Royal Ark Mariners, based in Wymondham. The donation was made up of £175 from Barnard and £500 from the East Anglian Mark Benevolent Association and will go towards supporting local people affected by cancer. The members of the Lodge were invited along to of our ‘Supporter Open Mornings’ where they get the chance to have a look round the centre and meet staff, patients and volunteers. We will be holding our next Open Day on Wednesday 8thMay from 10am – 4pm where you can find out more about the free support services they offer and even book a trial treatment. 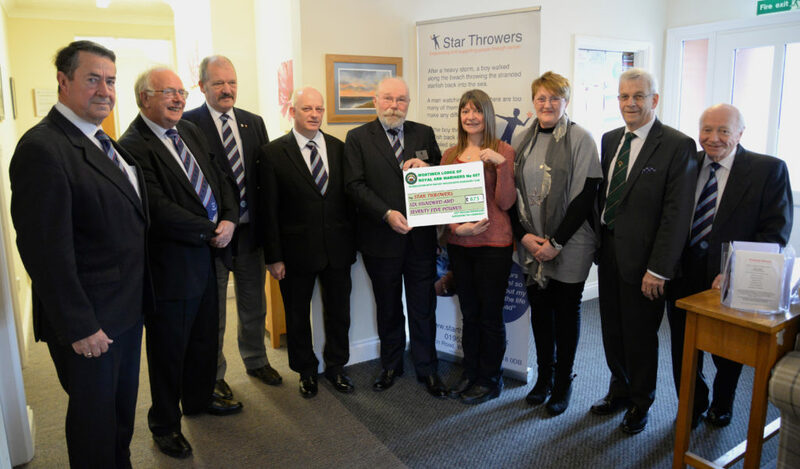 Pictured: Provincial Grand Master Paul Norman presenting the donation to Star Throwers Nurse Tina Hales and patient Jane Jayes, with members of Barnard Lodge of Royal Ark Mariners who are based in Wymondham. The donation was made up of £175 from Barnard and £500 from the East Anglian Mark Benevolent Association, which is the Mark Masons charity covering our Province of East Anglia (Norfolk, Suffolk and Cambs).